For a breath of fresh air in the bathroom, DIY one of these three all-natural solutions and replace unappealing odors with a clean-smelling scent. 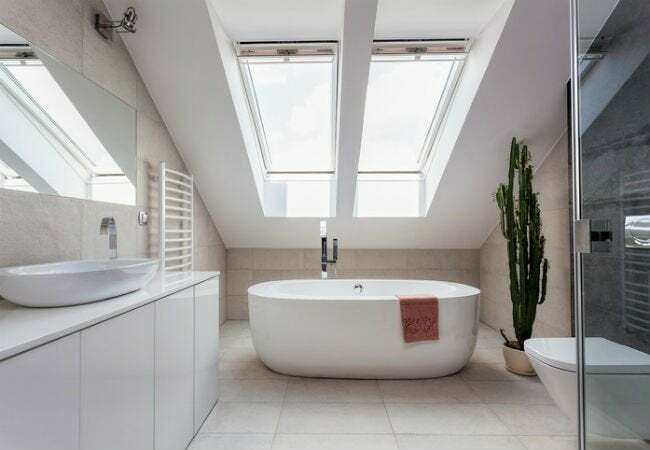 Bathroom odors rank as some of the most unpleasant household scents you can encounter, and they are definitely not ones you want to let linger. While sprays and store-bought products can be effective in banishing bad smells, they can also be costly and filled with chemicals you may not care to bring into your home. Instead of spritzing the off-the-shelf stuff, try mixing up one of these natural (and practically free!) air fresheners that absorb odors and leave your bathroom smelling exactly as you like it—fresh and clean. If you recently received a lovely bouquet of flowers, don’t toss them when they’ve reached their brittle end. 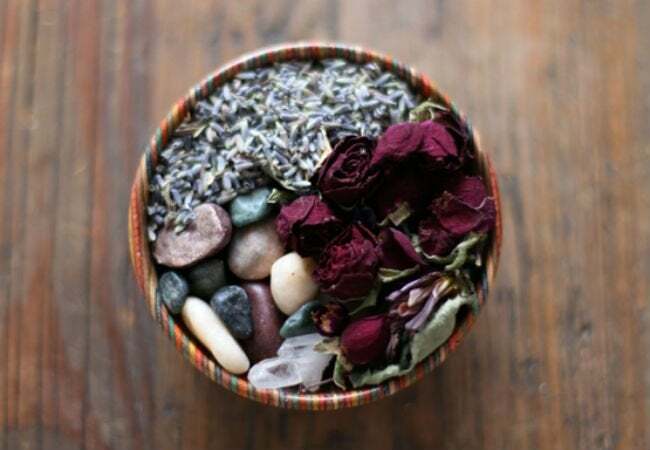 Instead, use the petals as the main ingredient in this DIY potpourri recipe. First, thoroughly dry the arrangement by tying a piece of twine around the stems and hanging it upside down for a week or two. After that, pluck the blooms from their stems and place them in a jar with a few drops of essential oil. Seal the container, and let the flowers absorb the oil for another week. Once they’ve had time to soak up the scent, you can mix in lavender, cloves, or other herbs or spices that pack a good-smelling punch. Display the concoction in a shallow decorative bowl in the bathroom for a pretty way to eliminate not-so-pretty odors. The next time you’re worried about persistent bathroom stench, try this five-minute fix that requires only a handful of materials—most of which you probably already have on hand. To start, fill a vase one-quarter of the way with the essential oil of your choice, such as peppermint or lavender, and then fill the rest of the vessel with baby oil. Next, rifle through your kitchen drawers for some bamboo skewers (yes, the kind you typically use for summer shish kabobs), trim the pointy ends, and drop them into the jar. The final step? Breathe deep and enjoy a freshly scented space. You’ll need a mason jar for this deodorizing solution, but rest assured that you can find the rest of the supplies in your cupboard. Fill a small mason jar about one-quarter of the way with baking soda, then add 8 to 12 drops of essential oil to the powder, adjusting the amount according to the size of your bathroom. (You should be able to notice the scent when you’ve added enough.) Next, pop the mason jar’s flat lid out of the ring that seals it tight and trace its outline onto a decorative piece of cardstock. 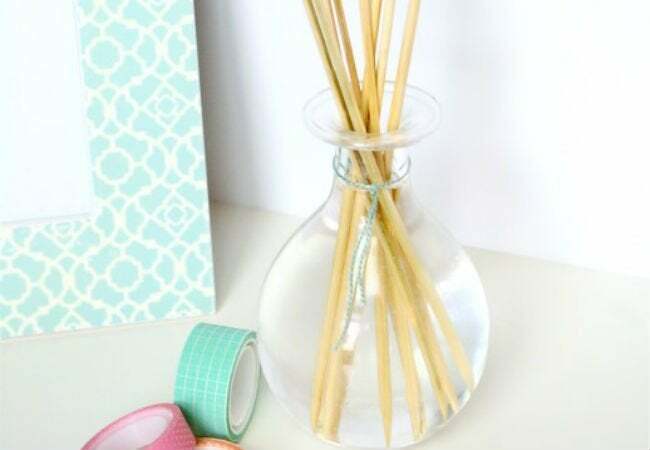 Cut out the paper and use a needle to punch small holes through which the scent can disperse. 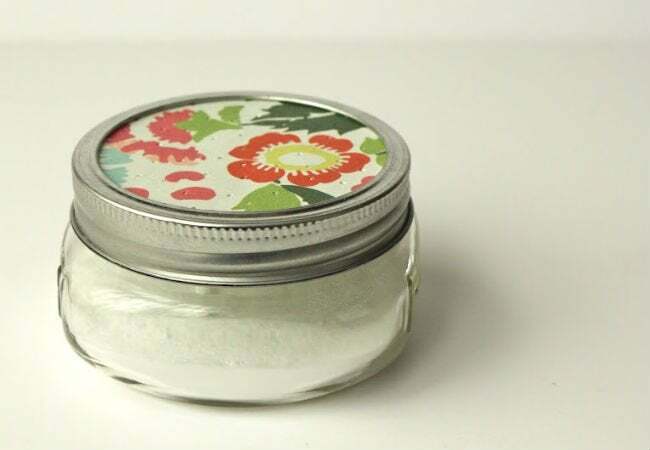 Finally, place the paper circle inside the ring (in lieu of the metal lid) and seal your jar for a colorful finishing touch. The secret to this trick’s success lies in the hardworking ingredients: baking soda absorbs unwanted smells, while the oil gives off a soothing scent, leaving your bathroom free and clear of unappealing odors.